Watching TV is more harmful to children's health than previously thought, new research claims. Children slumped in front of the TV risk health problems such as short-sightedness, obesity, premature puberty, sleep deprivation and autism, an analysis of 35 scientific studies on TV usage showed. The average six-year-old in Britain will have spent a full year of their life watching TV, and more than half of three-year-olds have a TV set in their bedroom, Dr Aric Sigman, the author of the report, said. Dr Sigman suggested that toddlers should be banned from watching TV and only allowed to watch "sensible amounts" after that. He added: "To allow children to continue to watch this much screen media is an abdication of parental responsibility, truly hands-off parenting." These views are backed by John Bangs, head of education at the National Union of Teachers . He told the BBC that many children "arrive in school 'tired and exhausted' from watching too much television". In total, 15 negative effects that excessive television viewing can have on youngsters were identified in the study, published in the science journal Biologist. It reports that permanent eyesight damage is strongly linked to watching TV, and that viewing may bring a bigger risk of obesity. It also increased the risk of developing type 2 diabetes. 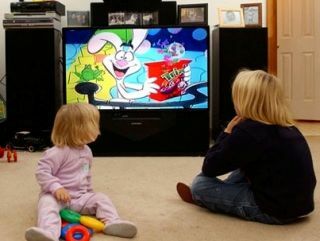 The report concludes that cutting children's TV viewing time should be a health priority and could save the NHS money. Dr Sigman said ignoring the findings could make us all "ultimately responsible for the greatest health scandal of our time".